Riverside Hemel Hempstead - Offer from Sprinkles! 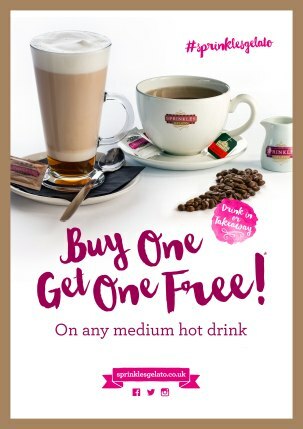 Buy one medium hot drink and get one free. Until 5pm on weekdays and 12pm on weekends. Exclusions apply, ask in store for more details. Some stores may have different terms and conditions. We reserve the right to stop this offer without prior warning and this page may still be showing. Store decision is final. *Some stores may not run this promotion during School and Bank holidays.